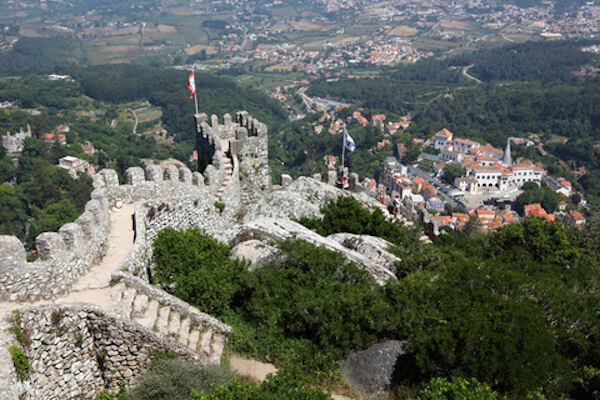 Sintra is a mysterious place, where the climate, history and nature invite introspection, art, dreams and fantasy. Let’s start the journey into its heart and feel the magic of a unique place. But before Sintra you have the Quelez National Palace, it’s a Portuguese 18th-century palace. One of the last great Rococo buildings to be designed in Europe. You will be amazed with the beautiful gardens and fountains. Arriving to Sintra, in the center of the old town lies the Royal Palace (The Sintra National Palace). Inside, there is a hugely rich range of mudejar style tiles brought from around the Islamic world and the astonishing Swan’s, Pega’s and Coats-of Arms’ rooms. Your next stop is Quinta da Regaleira, a place shrouded in mystery. Reportedly dating back to 1697. Climbing the mountain until you reach to the Castle of the Moors, also wrapped in mystery. Early documentary evidence shows that it was an Islamic stronghold, with some authors dating its foundation back to the times of the Visigoths. Continue the magical journey and you will find yourself on one of the mountain peaks, at the remarkable and fantastical Pena Palace. This colorful building looks like it is straight out of a fairy tale, an ultimate expression of Portuguese Romanticism. We cannot forget The Sintra Toy Museum, that contains more than 20,000 items gathered over more than 50 years.